Or, get it for 90400 Kobo Super Points! The essential guide to mastering endoscopic techniques of the upper GI tractWhile technological advances have made endoscopy one of the most common procedures for examining the upper GI tract, learning how to maneuver the instruments and interpret the images can be frustrating for those without experience. Designed specifically for those in training, Endoscopy of the Upper GI Tract -- with its more than 770 illustrations and user-friendly format -- is the most comprehensive instructional guide available.Beginning with a detailed introduction to all aspects of the endoscopic examination, this lavishly illustrated guide features:- Clear descriptions and images of all of the instruments and how and when they are used- Artfully combined photographs and 3D illustrations showing the exact location of the endoscope in relation to the anatomy of the immediate region- Step-by-step instructions for handling the endoscope, such as insertion, air insufflation, irrigation, and more- Useful checklists and tables that lay out the procedures from beginning to end, including preparations, necessary medication and anesthesia, required staff and supplemental equipment, potential risks and complications, etc.The book also encompasses a complete full-color atlas that illustrates the entire spectrum of both normal and pathological findings. In addition to detailed explanations of each finding, the authors provide- The endoscopic criteria and the most important differential diagnoses for each disorder- Series of images showing common variants, as well as comparison photographs of differential diagnoses -Useful guidelines for proper documentation A guide to interventional and extended examination techniques rounds out the text. All procedures, from treating upper gastrointestinal bleeding and collecting specimens to placing a duodenal tube and removing foreign bodies, are treated in full detail. 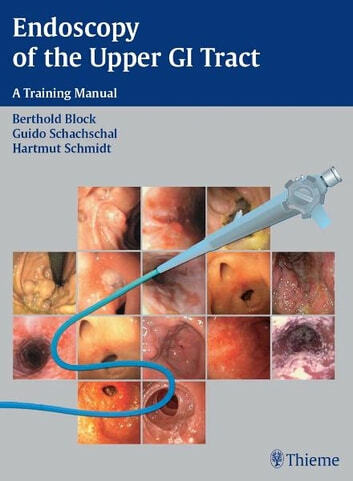 With its generous layout -- only one procedure is featured on every page -- and copious high-quality illustrations, Endoscopy of the Upper GI Tract is an essential for anyone wishing to master the subtleties of this most rewarding technique.